It's fitting, somehow, that after 91 years Nana would choose her son's yarhtzeit to decide that she was done. She lived the most amazing life and was a inspiration to me in many ways, especially in how you can reinvent yourself at any age and what an adventurous spirit looks like. I'm so sorry to lose her but thankful that the pains and frustration of daily living are no longer with her. And I'm deeply grateful that we were able to get down with Kai last month to visit her. 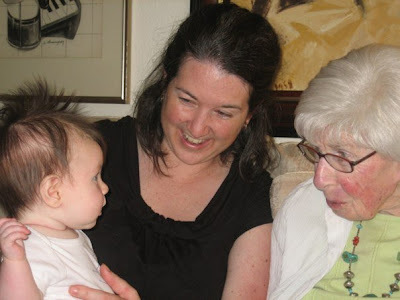 She had a great time meeting her great-granddaughter and we had a wonderful time introducing them. Becca, I'm so sorry this day has to hold more sorrow for your family. Thinking of you all and sending love.